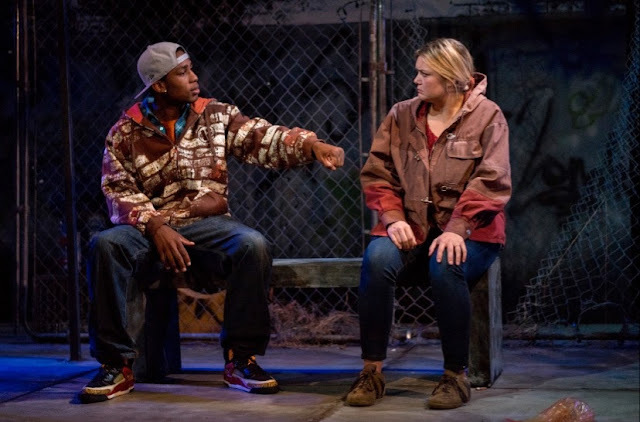 Carol's Theatre Reviews ~ It's Fun To Go Out: Moxie’s “Ironbound” Reverberates Long After Curtain. Moxie’s “Ironbound” Reverberates Long After Curtain. 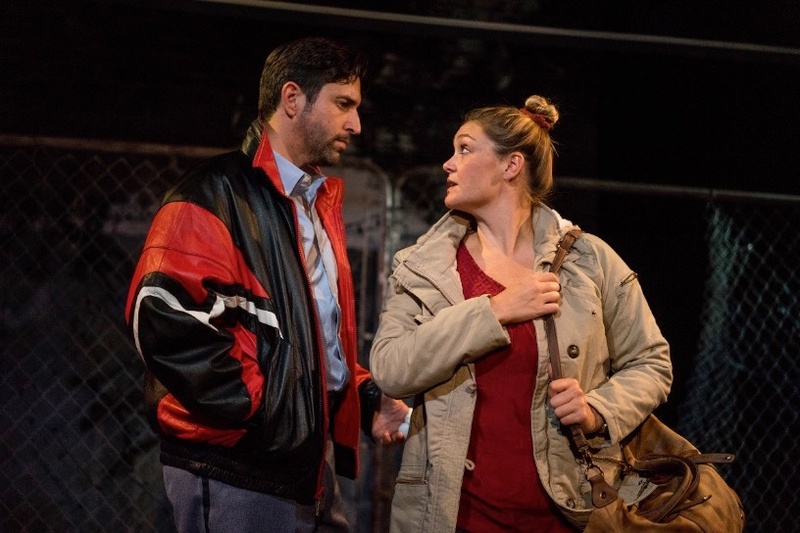 How fitting, a play written by playwright Martyna Majok an immigrant from Poland and based on her own mother’s experiences in America, that comes to light when so much of our focus these days in our nation’s capitol is around, about and disparaging immigrants. What’s lost in translation is that this country was built on the sweat and tears of immigrants. We are an immigrant nation at least we used to be. Over the years things and generations changed. In looking for a community to blame for our national woes, immigrants seem to be a good target these days. Moxie Theatre is having a 13th birthday. By all means in the Jewish faith that’s cause for celebration. So too can the Moxie’s, now under the leadership of Jennifer Eve Thorn, co-founder and now executive director, celebrate its 13 year by offering “Ironbound”, a deeply moving and oft times off centered comedy excellently acted, and supported by several immigrants in its midst. It is playing through Oct. 22nd at their Rolando Theatre on El Cajon Blvd. The story of Darja, a gutsy and defiant immigrant played with the same gusto as her character, Jacque Wilke shines as she jumps through a series of hoops to hang on to a life that is hell bent on bringing her down through abject poverty, an abusive second husband, an unfaithful lover and a runaway son. Her story begins, centers and ends at a rundown bus stop not far from the factory in Elizabeth, N.J. where Darja used to work, was laid off, and is now permanently shut down. Her story toggles back and forth over a period of 22 years. At present she is/was living as roommates with Tommy (a persuasive and convincing Eric Casalini) her errant roommate. Theirs was a rocky one and grew even more divided as she learns that he has been cheating on her with none other than the rich lady whose house she cleans as a second job to make ends meet. Fourteen times, she blasts out! She’s pissed. He wants her to get into his car and come home with him rather than wait for the bus that he knows will never come because of the late hour. She stubbornly refuses unless he gives her money $3000.00 to buy a car. Her son, (not seen) a drug addict, took hers some time back and disappeared, ergo the bus stop has become her permanent encampment. Her home away from home, the bus stop, is surrounded by broken chain link fence, an uninviting bench that she uses as her bed, and a kiosk showing bus schedules. The small surrounding area is littered with trash an old tire and whatever weeds have the guts to pop through. Credit Divya Murthy Kumar for the realistic setting; its almost another character. 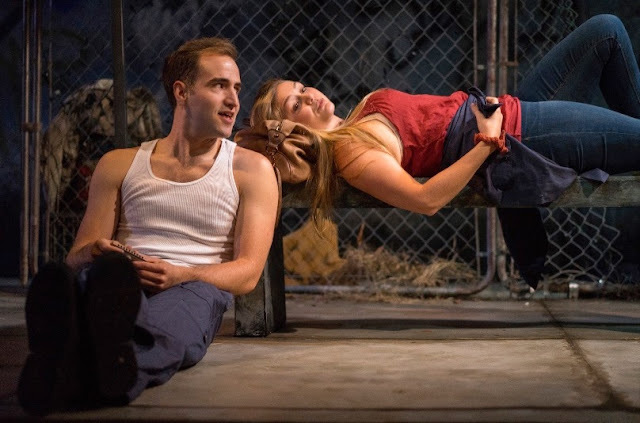 Flashing back in time to a youthful Darja and her first husband at the same bus stop, musician Maks (Arusi Santi) a dreamer who won’t let his immigrant status get in the way of his dreams heads off to Chicago where he wants to make it big as a blues artist. She’s also pregnant. Both immigrants he Santi’s Maks is easy going and sure enough of himself as he heads to Chicaco without her. With no skills her options are more limited. She gets the factory job, a houseclening job along with an abusive second husband. She abandons him and in time the factory closes leaving her out in the cold of the bus stop. While there she meets up a young hip-hop kid Vic (Carter Piggee) who does a second take when he sees her sleeping on the ground next to the bench. When she feels his presence and defensively jumps up, the two have to decide how they want this chance meeting to evolve. With skill, Majok takes a lonely and young, almost innocent boy out of his element and a spirited, tenacious and determined hard nosed and abused forty something immigrant and faces them off in such a profound and persuasive and yes, humorous way and with such convincing dialogue that one is stunned by the outcome. 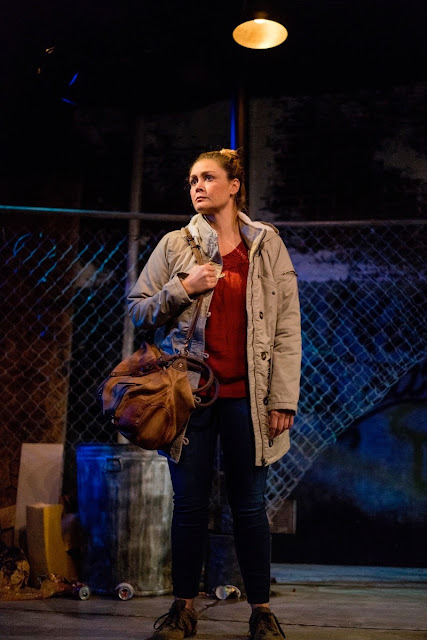 The playwright never loses sight of her characters strengths and weaknesses and with the expert direction of Jennifer Eve Thorn they spring to life bringing with them truth and defiance, frustrating bullheadedness and eventual hope that comes when Darja finally relents and goes off with Tommy. The bus stop is empty. Wilke, never one to slack on any role she is given pushes through with tough talk and certainty, as Darja becomes her own worst enemy. She’s antagonistic and hostile and pushes everyone in her line of fire away except when she softens around the edges as Vic tries to offer her money. In her quest to find and help her son her motherly instinct takes the place of her hostility, but that’s it! Others in her orbit mostly react. Tommy finally gives in to her blind stubbornness. Maks leaves in spite of their love and Vic, feeling sorry for her pushes cash into her hand so she can get off the streets and sleep in safety. Life has never been easy for the immigrant then and now. With a wakening call Majok brings out the good, the bad and the ugly of it all. Scenic designer Divya Murthy Kumar hails from India, costumer Anastasia Puatova from Russia, and actor Asuri Santi is from Mexico. Others in the creative team include Alex Crocker lighting and Haley Wolf, sound. Imagine if half he team were not allowed here what we would be missing?